The identity of Banksy has been baffling people worldwide for years. Banksy’s identity has remained unknown ever since he appeared on the art scene. He operates under the cover of darkness and keeps his identity closely guarded. His artworks range from dark humour to controversial political statements. His graffiti artwork is in various locations around the world. 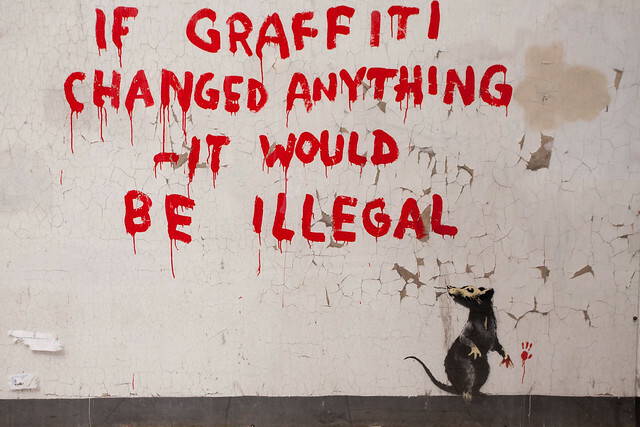 What Do We Know About Banksy? Banksy started his career as a freehand graffiti artist during the early 1990s. Banksy joined a Bristol based graffiti crew. By the late 1990s, he became a more recognised graffiti artist around the Bristol and London area. He had moved away from freehand work to more stencil focused work. People started to recognise his signature work. In 2002, Banksy debuted his first art exhibition in Los Angeles. During 2010 he became an author and filmmaker with the successful film “Exit Through The Gift Shop”. His latest known project, during the summer of 2015, was Dismaland. 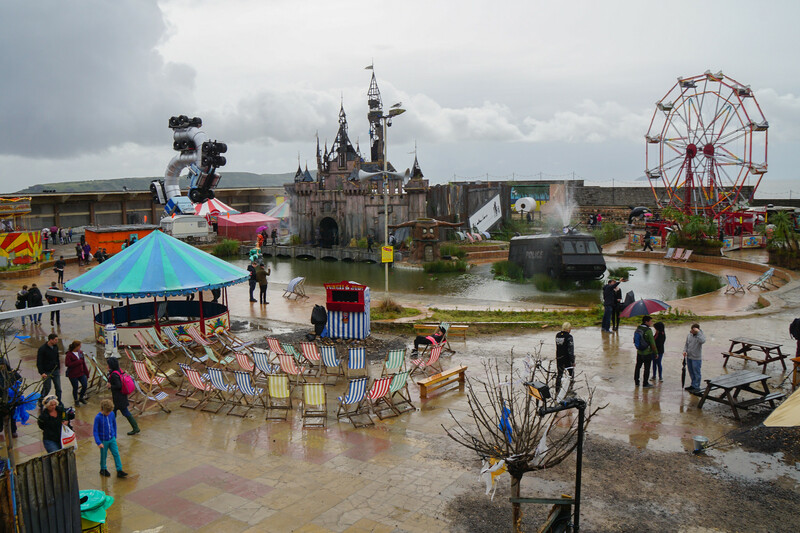 Dismaland was a temporary art project. It was open for over a month and was a real sinister twist on Disneyland. Banksy has created hundreds of art pieces worldwide. How many of them are genuine Banksy pieces is another unsolved mystery. 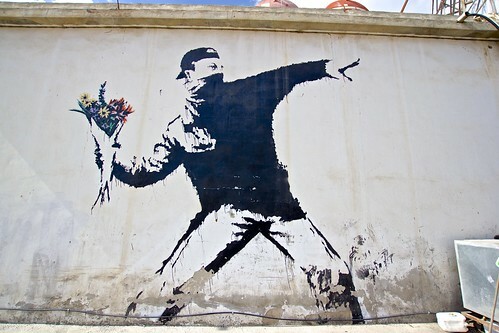 One his most iconic pieces is the Flower Thrower. You can find the artwork in Jerusalem and has been a standout graffiti piece since released. 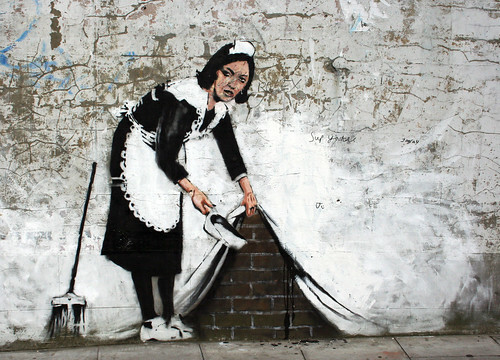 Sweep It Under The Carpet first appeared in 2006 at Chalk Farm, London. The portrait of the maid called Leanne is still the most iconic piece from the capital. How Much Does Banksy’s Work Sell For? 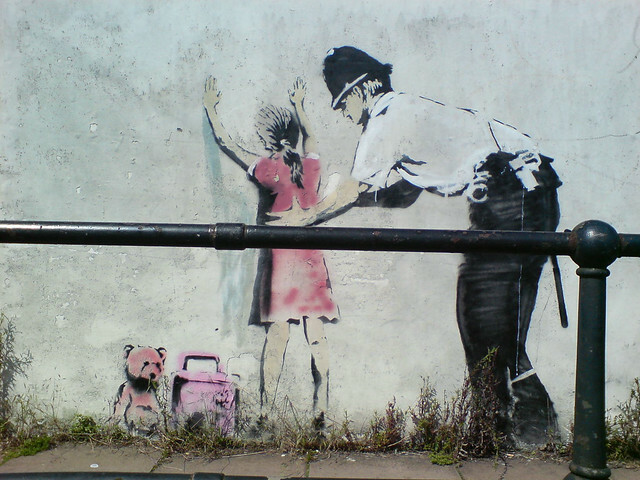 Over the last decade, the price of Banksy’s work has skyrocketed. From sitting on the shelf at an art exhibition catching dust for £300 to being fought over for millions. His most expensive piece ever sold was £1.4 million in 2007 at a charity auction. The difference in price just shows how far he has come. Yet, not all Banksy artwork needs to be expensive. You can add some character to your walls with Banksy vinyl wall art. A special Banksy giclée print. Add the personal touch to a laptop with a Banksy Macbook sticker. Is It Vandalism or Art? Will We Ever Find out Banksy’s True Identity? The artist has stated before that he will never reveal his identity. In the very few interviews, Banksy has given very little has been given away regarding his identity. All we know for certain is he will continue to produce impressive, thought-provoking graffiti artwork. The mystery of Banksy will continue. This entry was posted in Art & Design and tagged banksy, street art.